Inspired by her home located at the foothills of the Catskill mountains in upstate New York, artist Teri Stratford captures the natural beauty of her environment by creating works of art from hand-picked botanicals. 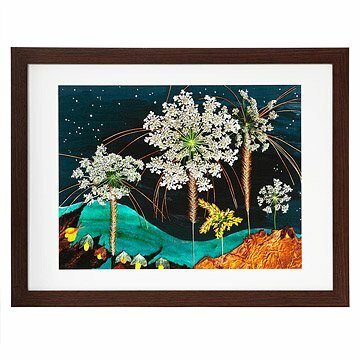 In this piece, she arranges flattened sprays of delicate Queen Anne's Lace into an explosive fireworks display against a night sky populated by the Archer and Orion's Belt constellations. Fireflies made of barberry leaves, goldenrod, and rhubarb line up along the bottom of the piece, ready to flit back and enjoy the show. As leaves are biodegradable and will fade and deteriorate over time, each of Teri's leaf "paintings" is scanned or photographed immediately after its creation, preserving its beauty long after the originals are gone. Printed in Portland, Oregon. Love of nature and creativity have gone hand in hand from childhood for Teri. Her family always had a garden and she always had a sketchbook! After 35 years as a Photo Editor, Teri has transitioned to Artist, taking full advantage of the lush growing environment of the Northeastern USA. Teri's passion for spirituality, nature and creativity has finally found the perfect outlet. Leaf Art began with collecting brightly colored fall leaves while walking a country road in the 1990's. Laying them out on the kitchen table, a simple collage took shape and was titled Leaves In My Garden Grow. What began with a minimum of 10 images each fall has expanded to year round creating. Leaf Art awakens and strengthens appreciation and connection with nature by magnifying nature's beauty, infinite variety and detail. Playfulness is important too. Often subjects chosen and image titles express that aspect. These are "feel good" images, embedded with joy! Taking home Leaf Art is taking home JOY. Read a Q&A with Teri on our blog. Arrives ready to hang with a wire hanger, includes care instructions and artist card. It's a very bright picture with many colors to match all the decor in my home. The frame it comes with it seems to be of good quality. The fact it came framed made it easy to receive as a gift.